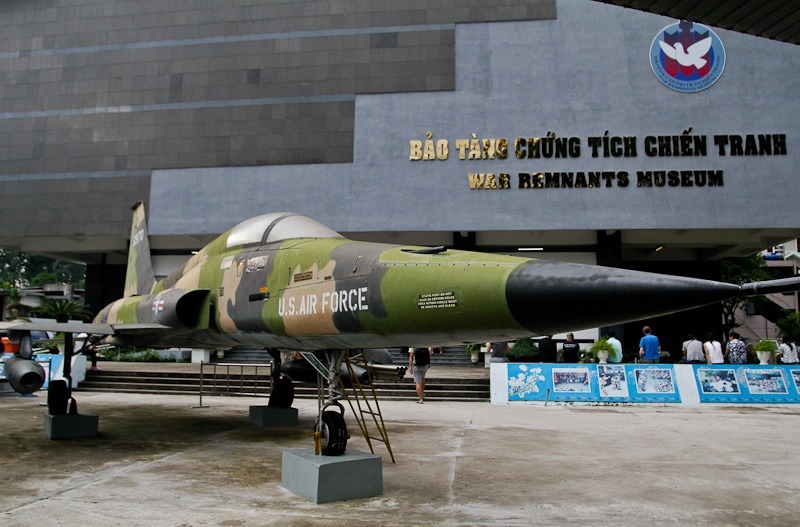 The War Remnants Museum is a war museum at 28 Vo Van Tan, in District 3, Ho Chi Minh City (Sai Gon), Vietnam. It contains exhibits relating to the Vietnam war and the first Indochina War involving the French colonialists. Operated by Vietnamse government, an earlier version of this museum opened on September 4, 1975, as the Exhibition House for US and Pupet Crimes. It located in the former United States Information Agency building. The exhibition was not the first of its kind for the North Vietnamese side, but rather followed a tradition of such exhibition exposing war crimes, first those of the Frech and then those of Americans, who had operated in the country as early as 1954. In 1990, the name was changed to Exhibition House for Crimes of War and Aggression.droppong both “U.S” and “Puppet”. In 1995, following the normalization of diplomatic relations with the United States and end of US embargo a year before, the references to ” war crimes” and “aggression” were dropped from the museum’s title as well; it became the War Remnants Museum. The museum comprise a series of themed rooms in several buildings, with period military equipment placed within a walled yard. The military equipment includes a UH-1 “Huey” helicoper, an F5-5A fighter, a BLU-82 ” Daisy Cutter ” bomb, M48 Pattin tank, an A-1 Skyraider attack bomber, and a A-37 Dragonfly attack bomber. There are a number of pieces of unexploded ordnance stored in the corner of the yard, with their charges and/or fuses removed. On building reproduces the “tiger cages” in which the South Vietnames goverment kept political prisonners. Other exhibits include graphic photography, accompanied by a short text in English, Vietnamese and Japanese, covering the effects of Agent Orange and other chemical defoliant sprays, the use of napalm and phosphorus bombs, and war atrocities such as the My Lai Massacre. The photographic display includes work by Vietnam War photojournalist Bunyo Ishikawa that the donated to the museum in 1998. Curiosities include guillotine used by the French and South Vietnamese to execute prisonersm the last time being in 1960, and three jars of preserved human fetuses allegedly deformed exposure to dioxin anh dioxin-like compounds, contained in the defoliant Agent Orange. Vietnam war is one of longest time war of the world in 20 Century! 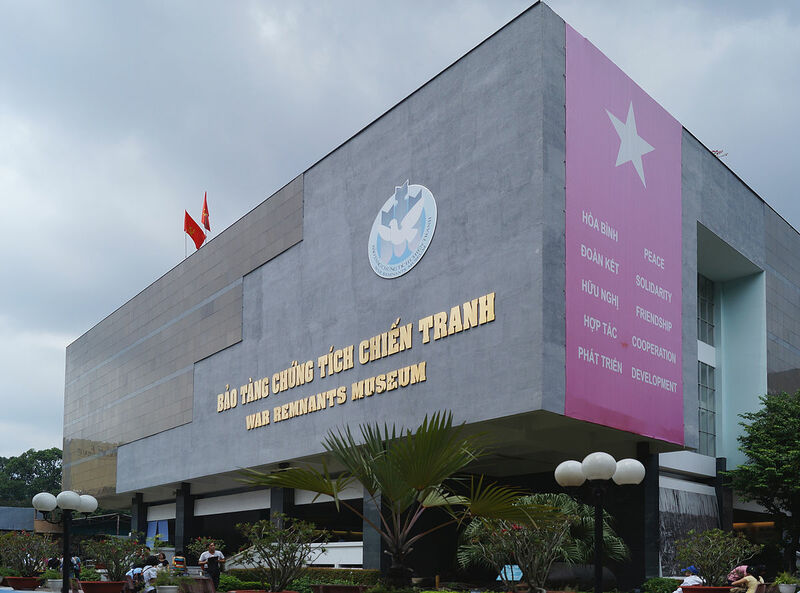 The War Remnant Museum is currently one of the most popular museums in Vietnam, attracting approximately half a million visitors every year. According to the museum’s own estimates,about two-thirds of these are foreiners. US anthropologis Christina Schwenkel wrote the museum attempts to convey historical truths with ‘self-representation’, presenting images and other features without contextulising them as other museums do. 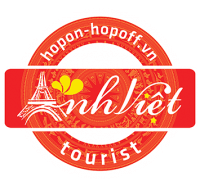 Museum curators are described as being privy to the fact that knowledge about the Vietnam War and the interests of the Vietnames is not typically known in other nations. An analysis of the impression books revealed that the museum’s visitors used to the mostly Europeans and North Americans before 2005, but that its audience became much more varied after Vietnam dropped their visa requirement for ASEAN countries that year. The impression books also record mixed responses to museum. Others simply praised Vietnam, while some Americans harshly criticized the museum for its “propaganda” and “glorification of victory”. Broadening interests have expanded from other countries as well, including visits from tourist from Brazil, Turkey, South Africa and others expanding to see museum. Vietnamese Agent Orange dioxin victims!